Keshia and omarossa are nominated. Ross – lets do that.. yeah..
Ross – next time them come up lets throw some out.. They talk about how funny Meta is. 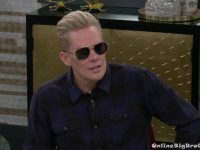 James mentions how there will be people salty near the end. Ross says he has 2 houses one in Palm springs and one not far from the Big Brother house. They begin a conversation about real estate. Ross – if you’re lucky.. it’s almost impossible in big cities.. it’s so expensive. Brandi and ROss high five. Brandi wants to make sure they are still good. 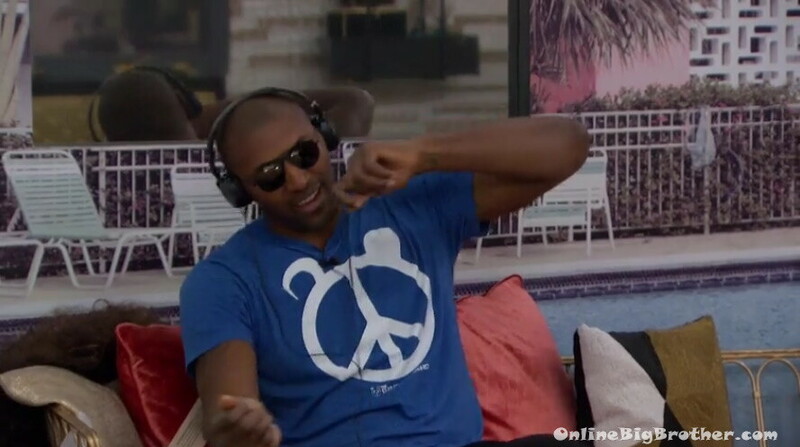 Ross – I’ve never lied to you once..
Ross – this game is tough and we might look at each other and realize someone has to go..
Ross – I’m with you..
Ross – one of them is going home.. James or Shannon the first chance the house gets..
Ross – After Metta it’ll be one of us. 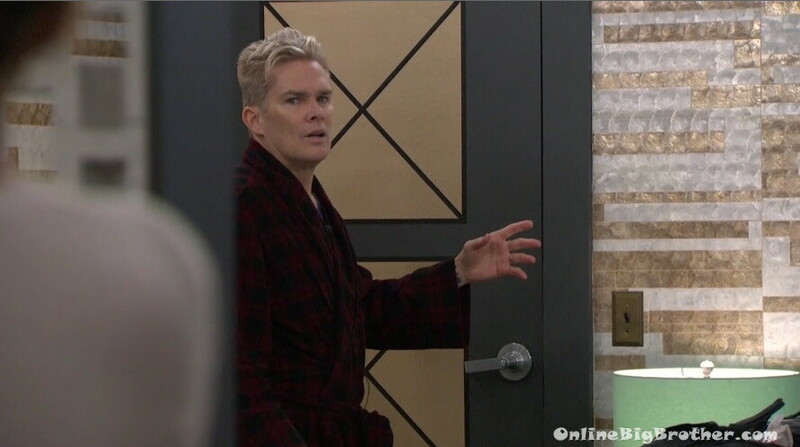 Brandi and Ari talking about how they should have their own show..
Ari – can you imagine us making a show running around making silly faces..
Mark comes in Looking for the blow dryer. Marissa – I told Metta we all feel the same we all miss our families. 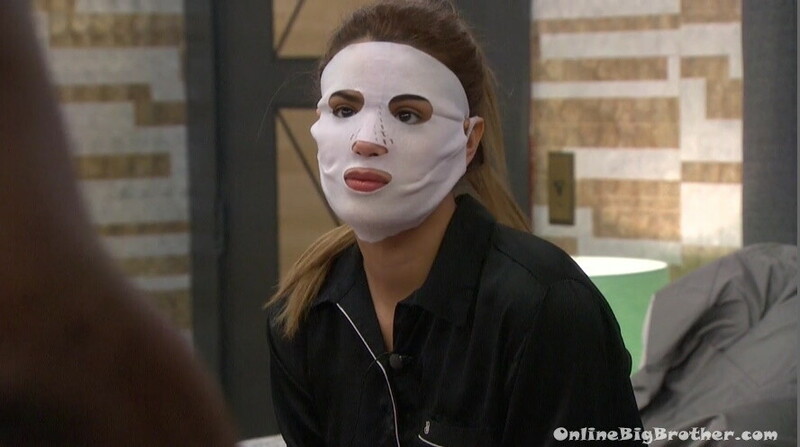 Marissa to Brandi – your t1ts look really good..
Metta is still applying the makeup.. THey mention putting more makeup on the T zone. Mark tries to fit in..
Ross – the point is to break them up Omarosa and Keshia because they are a powerful duo. Ross – if Omarossa doesn’t come back you no longer have to break them up..
Ross – if you were to break up anybody in this house who would that be? Ross – listen.. Shannon lied to us about the Omarosa thing.. and she’s playing harder than James. Ross – i can still nominate Kehsia and Metta and we can still decide down the road. Ross – I’m probably not going to do it but if Omarosa doesn’t come back.. it’s just a teeny tiny nugget of an idea. Why is Ross no longer in the alliance with Shannon? I liked the alliance Ross/Shannon/Marissa/James. He can’t beat her for the win. He can easily beat Brandi. He’s going for the gold. 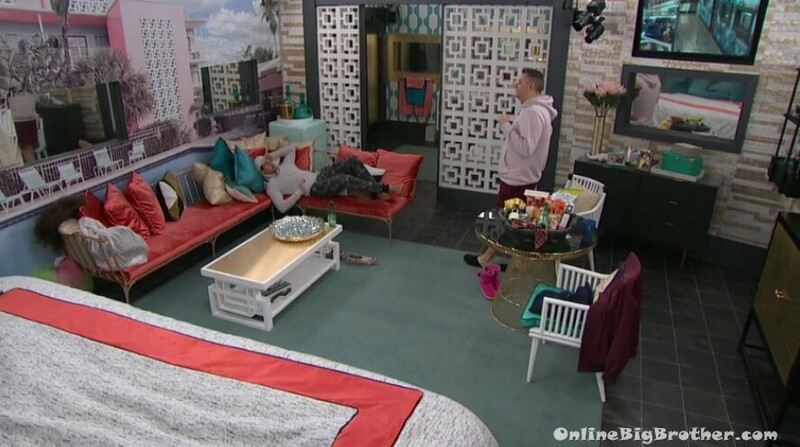 I love Ross he’s the one I’m rooting for , but he’s become cocky as hell lately I don’t know if it’s just him being HOH or something ,but I don’t like it one bit … I don’t think he understands how loyal Marissa is to Shannon and that’ll be his downfall . If Marissa had to choose between Ross or Shannon she’ll chose Shannon in a heartbeat ,Ari doesn’t know what she’s doing she’s basically a floater , and Brandi is just Brandi . I think Ross will be gone before Shannon or James will in my opinion he has no sway in the house unlike someone like Shannon or Sadly to Say Omarosa. so why are you rooting for him then? Hilarious when Rissa laughed in Ross’s face when he threw out the idea of backdooring Shannon. Good luck with that lumpy man. And Shannon already is on to you and when Rissa tells her this little idea you threw out…you just keep digging your own grave. Ross thinks he runs the house. SO FUNNY! I don’t hate Ross but it will be a joy when Shannon sends him packing. You are decent at the game Ross. Shannon is elite. You can’t beat her. You might as well beg her to get you to F3 and pray for the best after that. Getting ready to chill with some wine and fruit and watch AD. I have a feeling tonight should be some good game talk. I like both Ross & Shannon (my #1 fav), but I think Ross is moving on Shannon way too early. Brandi & Ari are clay figures that can be manipulated by anyone. So, if I were Ross, I wouldn’t hope that they stay loyal to this latest group. Hope Marisa stays loyal to Shannon. Ross could easily get Keisha & Oma to vote out Shannon. We’ll see….. This has been way better than I expected, but it still suffers from the same superfan dynamic that so paint-by-numbers with regards to strategy and gameplay. You want a house full of Mettas? doesnt know HoH comes with immunity. 6.) If you’re black and have flaws, you’re out. I enjoy the rapid pace of this game…I only wish BB could be played like this all the time. Two people gone a week, keeps everybody on their toes. No 3-4 days of everybody knowing the evictee and nobody switching things up…anyhow, fun break to see the game mid-winter! Thanks to Simon and Dawg for giving us a little something here too! The house isn’t big enough for 30+ players, sorry! Right, but CBS has a pretty big slice of property where they film this…I know there are some great architects in L.A who could do some work to accomodate a few more bedrooms and washrooms. Plus, how about an outdoor shower??? Anyhow, yes, hadn’t thought about how quickly the show would be over, so, skip that! Black people can be racist. Woman can be sexist. I hate that because a black person is targeted it’s becoming racist. In this case it has nothing to do. Just that they are becoming arrogant and others turn on them. Nothing to do with skin color. Omarrosa and Keisha brought this on themselves by teaming up and trying to tell others what to do. Also, Keisha was making deals behind the alliance’s back. It has nothing to do with being black. Sometimes it’s not about race, duh. O is just a bully and a b*tch. K was on a power trip being HOH she didn’t even earn. O is more dangerous. Vote her out. Ok. AD is annoying. Everytime someone starts talking game tonight they cut to commercial. Grrrrr. I dnt get the feeds for once and now this. No. Not getting ’em. I have no time. Ha. Keisha is salty as fk about being nominated. Haha. Like what? It’s a game. I do not like her. I like Oma more and that is saying something. Keisha for sure needs to go next. I wonder if Omarossa still gets paid the $1.2 million if she goes home Monday night? I wonder why CBS decided she was worth that kind of $$$? Anyhow, it seems like Kesia might be the one leaving…?